To get ready for the half I hit the roads again but my muscles and breath asked “where’s the steep stuff and the nice power walk breaks?” Unfortunately that question came up again during my race. With the Ray Miller 50k coming up in November, I could have approached the half as purely a long run and left it at that. With a wicked heatwave the week before the race I had even more incentive to treat it that way. But I had some friends from high school come up to run the half as well. My former classmates, many of whom were on the Pasadena High School football team have a running group that’s called the Dawgpack. I was a trainer for the football team my Junior year and then I often covered the games during my Senior year for the school newspaper so I had been through the trenches with some of the Dawgpack. I got together with about half of the Dawgpack that came up to run and we had an interesting dinner (long wait and seating in left field) at a nearby Italian restaurant to do some carbo loading. 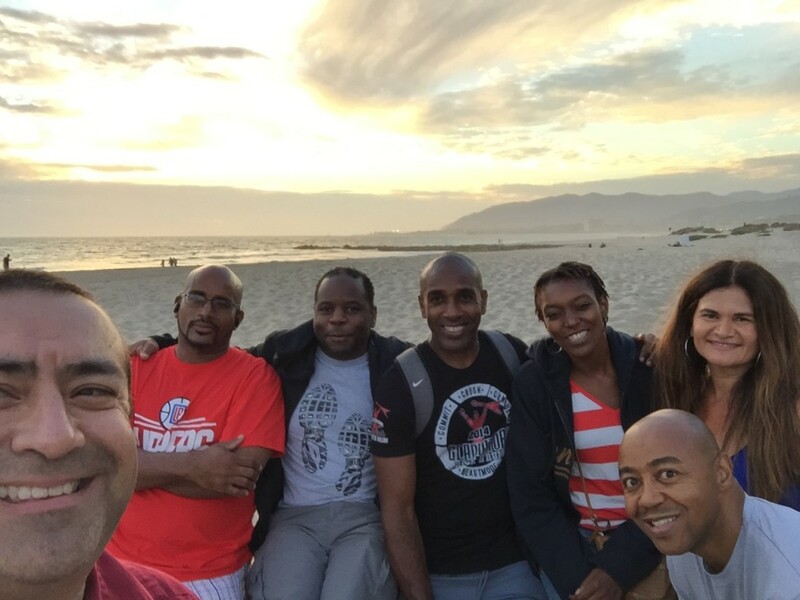 It was great catching up with the group. I was up at 4a.m. and took down a pb&j with coffee to get things moving. I headed off nice and early to make sure I got parking in the main parking area to avoid extra limping around after the race. I wasn’t sure where the finish line or starting line were so I looked around until I found them then stood by to catch the start of the full marathon which was 30 minutes before the half race. As the full marathon was on its way, I made my way back towards a bathroom. The Crowne Plaza is very accommodating when it comes to people using its facilities so a big thanks to them. Saved me a long port-o-potty wait. I’ve organized a lot of events at the Crowne Plaza before so I don’t forget about them. Before I knew it I had to go back up on the pier and get ready for the race. My Nike+ Sportswatch was misbehaving and wouldn’t connect to my heart rate monitor so I was fumbling around and didn’t get to take any shots from the half’s starting line. I decided to just turn off the heart rate feature and that did the trick. My music was all set as well. I carried my iPhone 6+ in a large baggie because I knew it would get hot out there and I didn’t want to fry the phone. The morning was fairly cool and it was still pretty dark when the race started but the skies were clear. Once the sun came out things would get hot in a hurry. I started on a steady pace that would have led to a PR but that plan started to fizzle around mile 2. I didn’t feel bad during this stretch but after around mile 3 I had to start taking short walk breaks. These walk breaks got a bit longer and longer. By mile 3 the sun was breaking but there was still some nice shade from the large trees lining the fields to our left. At this point I wasn’t too far behind the 2:30 pace group but by mile 5 the 2:45 pace group passed me. My run to walk turned into a walk to run strategy. I’d run for 100 feet then slow down and I felt pretty winded and a bit light-headed. Around 7 miles in I took my third GU gel and didn’t sip water quick enough and felt nauseous. I thought I might toss my cookies around McGrath Park then the thought that I helped push to keep the park open a few years ago when it was in danger of closing and that helped things settle down in my stomach. The course is an out and back so I could see all of the Dawgpack come back towards me and I could see their times based on their proximity to the pacers. I cheered them all on and that was fun. I finally hit the turnaround at mile 7 and was now running towards the start and could see the Los Padres Mountains. I still felt pretty blah but the not hot yet sunshine and the mountains put me in a very blissed out state. Even though I wouldn’t be anywhere near a PR I felt good that I was out there getting it done. Plus, there were still a lot of speedy people out there because the fast marathoners were zipping by on their way to Boston Marathon qualifying times. I thought about how long the journey has taken to get to this point where I could go out and run a half marathon even after a short and shabby training cycle. There was also a group of five of us who were leapfrogging each other in our run walk cycles and that helped keep me engaged in the race aspect. The last few miles didn’t last too long but I was a little thrown off because my watch had me at half a mile beyond what course marking had listed. I kept making plans to hit a solid run for the last two miles to finish strong but that plan continued until it was half a mile to the finish then I was able to finish strong. I think one full marathoner even raced me a bit at the end because he thought I was in the full marathon. I didn’t mention it earlier but all the volunteers on the course were great. I never passed by an opportunity to high five a volunteer or someone cheering and each fist bump game me a jolt of energy. I had plenty of water and poured half of it over myself throughout the race. It was indeed a hot morning but the water-cooling effect helped out quite a bit. As I got towards the finish line I saw one runner cramping up big time and another was on the floor being attended to. It was a flat course but the run back was hot and didn’t have all the cover from the early morning. I was pretty sure that all of the Dawgpack had already finished at least 2o minutes before I did so I just took down some watermelon, water and bananas and chilled for a bit. There was no crazy vision problems after this race so that was good. I took my time and considered cooling my legs in the ocean but wasn’t up for dealing with a car full of sand so I headed for the nearby In-N-Out to grab a large drink and fries to replenish some salt and get my sugar up. I saw one of the Dawgpack members back out there already doing his shakeout run. That’s dedication! Good job, Damon! I could be hard on myself and just think about how this was my slowest road half marathon race but I feel pretty good that I got it done and finished with a big smile. This was a great training run to get me back onto more speed training to help me better negotiate the Ray Miller 50k distance. Completing a 50k run this year is still my goal and I have at least one more chance at it. Time to keep on with the training! 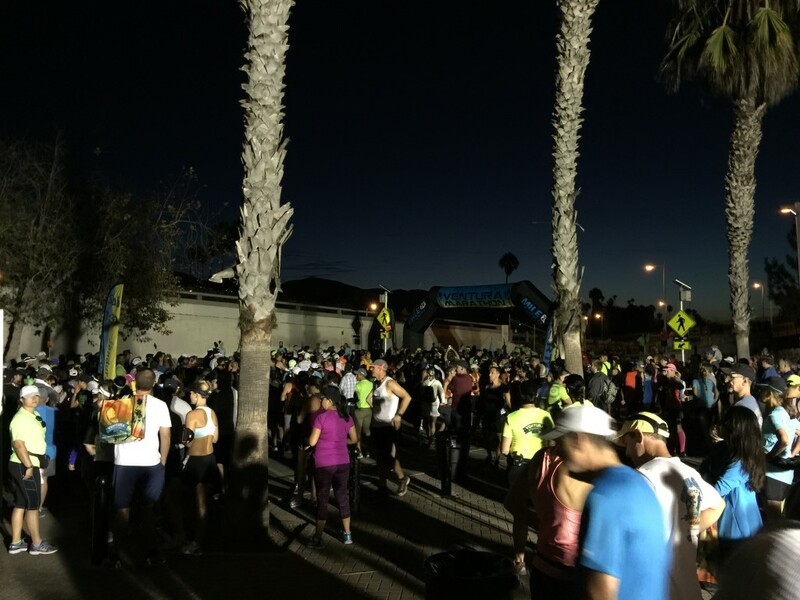 Did you run the Ventura Marathon races? How did it go? Have any other races you’re thinking of doing? Let me know here on the comments or on Facebook. 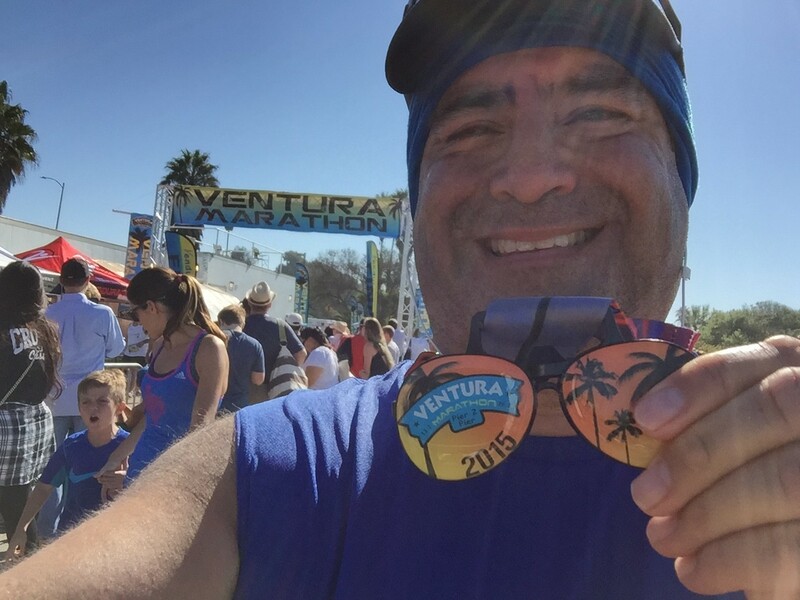 This entry was posted in Health and tagged 2015, Beach, Dawgpack, football team, Half Marathon, PHS, Race Report, Ray Miller 50k, Ventura Marathon. Bookmark the permalink. Great recap of the day. It was great seeing you out there and I look forward to running with you again. Hope to run with you all again, Michael!